So the baby is napping right now, which means I probably have another half-hour to work on the computer uninterrupted. 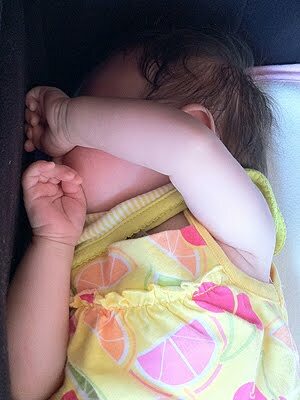 (Dear Sleeping Gods, thank you for sending me a baby that is borderline narcoleptic.) I’ve decided to use this napping block to write a blog. Next nap, I’m gonna work on the book. The evening nap, I’m going to work on consulting projects. This is how I’ve decided to structure my day. When I started this whole mommy thing, you know a whopping three months ago, I assumed that an hour was not enough time to accomplish anything work-related. So I used these naps to shower, eat lunch, drink coffee, do laundry, yadda yadda. And I basically waited for the baby to wake up so we could play again. Now, I’ve decided I’ve been doing this all wrong. I can eat while she’s in a swing and not consider it neglect. I can fold laundry while she sits under a mobile. I can blow-dry my hair while she stares at a ceiling fan. Not cooing and playing and reading with her ever second her eyes are open does not make me a bad mother. And by accepting this, I’ve now freed up my naptimes for actual brain activity. Sure, you might not be able to write a whole book in an hour, but you can edit one chapter. And that’s something. Plus it keeps my brain from rotting. And what could would a mommy with a rotten brain be? Yucky, yucky.